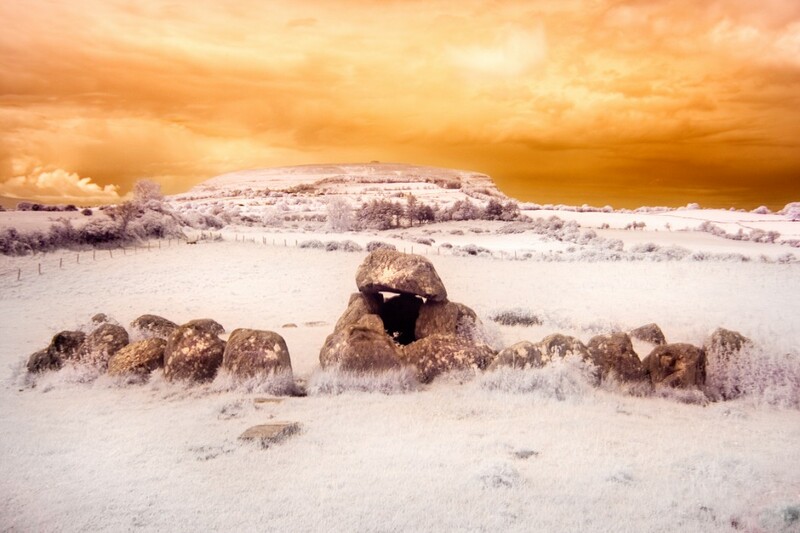 This infrared photograph of a dolmen and surrounding stone circle was taken at Carrowmore megalithic cemetery, County Sligo. The tomb is overlooked by Knocknarea Mountain. Carrowmore is the largest and one of the oldest cemeteries of megalithic tombs in Ireland, with monuments ranging from five and a half thousand to six and a half thousand years old. Archaeologists have recorded over 60 tombs of which 30 are still visible. Almost all the burials at Carrowmore were cremations. There have been several recorded excavations at Carrowmore, ranging from the survey work by George Petrie in 1837 through to the modern excavations in the early 1980s by a team of Swedish archaeologists led by Stefan Bergh.